Jan Mouritsen, Per Nikolaj D. Bukh et al. 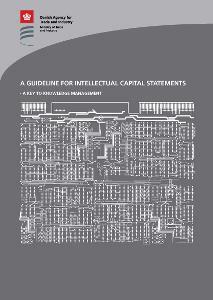 A Guide for Intellectual Capital Statements - A Key to Knowledge Management. 2000. Ministry for Science, Technology og Development. A Guide for Intellectual Capital Statements - A Key to Knowledge Management represents the first key to knowledge management in the world to be based on the experience gained by a major group of companies in preparing intellectual capital statements. The guideline is the result of the unique collaboration of companies, consultants, government officials and researchers over several years. See also the research based publications from the project. The objective of the guideline is to act as a source of inspiration to other companies in preparing intellectual capital statements by demonstrating a practical approach. The increased interest in intellectual capital statements reflects the concern of more and more companies in realising the strategic importance of knowledge management in the broadest sense. They are aware of the growing need for developing their knowledge resources still further. More over, they want to be able to communicate this development in a comprehensible and credible manner. Experience from the participating companies shows that the task is quite a challenge, but not an impossible one. They also found that the intellectual capital statement leads to impressive results - both within the organisation and externally in relation to customers, investors and society.